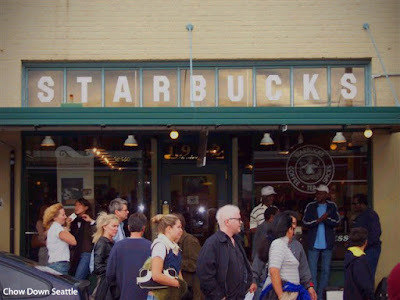 Chow Down Seattle: FOOD NEWS: Really Starbucks? The Trenta size? FOOD NEWS: Really Starbucks? The Trenta size? Do we really need a super-sized ice coffee? When fast food chains are under scrutiny for their unhealthy meals and over-sized drinks, Starbucks decides to join the gluttony parade. Starbucks announced today it will be rolling out a 31oz drink size called Trenta. The new size has been test-marketed in Phoenix and Tampa since March 2010. Now the new size will be available nation-wide starting this May. Does Starbucks really need to offer a size larger than the Venti, which is already 24oz? 75% of American adults are overweight or obese. The size of the Trenta is the equivalent of 2.5 cans of soda. The Huffington Post has an illustration showing how the new size compares to the human stomach. I like Starbucks coffee and I get myself a tall latte most mornings, but I could not imagine gulping down a 31oz iced coffee. Starbucks seems to be getting further away from the Italian coffee experience it once was trying to bring to the U.S. Italians don't drink 31oz coffees, they drink small espressos. The Trenta is larger than a bottle of wine! This is just another way for Starbucks to make more money. Just like how Starbucks does offer a "short" size coffee, smaller than a "tall", but they don't list it on their store menu. Oh well, I guess the U.S. will continue to be known as the country where everything is larger, even our waists. I remember being a kid and thinking that the Big Gulp at 7-11 was the biggest thing I had ever seen in my life and would take me all day to drink. Now the same thing is a Medium-size drink at many places. Not only that, but think of the sugar and cream that some people will put in it, and how much of both you'd need to get any flavour. You can only hope that most of that 31oz of ice coffee will be just ice. They cannot be serious? I mean how much is too much and when is it recognizable..... oh yeah - this is! !